A slow-moving storm will impact travel statewide starting Wednesday night into Thursday. The Colorado Department of Transportation (CDOT) is warning motorists that winter storm conditions have been are expected through Thursday. The National Weather Service (NWS) predicts heavy snow will develop over Utah and the Four Corners region, with snow spreading over the mountains late overnight, and then over the eastern plains by early Thursday morning between 3:00 and 4:00 a.m. The potential snow accumulation on the northern mountains (Berthoud Pass and Loveland Pass) has also prompted the Colorado Avalanche Information Center (CAIC) to caution high country motorists of likely snow slide mitigation along mountain pass corridors. The avalanche control work will cause travel delays while operations are taking place and plows then clear the roads. "This time of year, we have a lot more people on our roads due to the holidays," said Kyle Lester, CDOT Director of Highway Maintenance. "Our snowplow operators will be out in full force pretreating our roads before the storm and they'll be out there until the system moves out of the area using their deicing products and plow blades. We ask the public to join us in making the roads safe by being prepared for winter driving before getting behind the wheel." Worn tires can't grip the road well and can be extremely hazardous. Check your tires by performing the Quarter Test. Insert a quarter into the tire tread upside down, with Washington's head going in first; if the top of George's head is covered by the tread, your tires are OK (do this test in multiple points around each tire). If the top of his head is visible at any point, you need new tires. Invest in safety by getting a set of snow tires. When it comes to stopping safely on snow and ice, all-season tires simply don't compare to winter tires (see infographic). Weather Impacts: Regionally throughout the state, motorists can expect the weather to impact travel. Roads will be icy and snowpacked by tomorrow morning's commute with the most intense part of the storm likely hitting between 3 and 5 a.m. 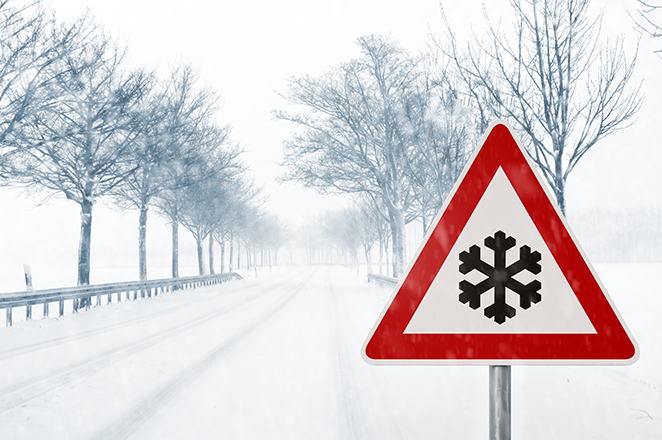 Motorists should be cautious while driving over bridges, overpasses and ramps as these areas generally produce icier conditions. Crews in the metro area went on snow shift at 3 p.m. and have been applying anti-icing product since this morning, motorists will likely see white stripes on the roadway as a result. Travelers should plan ahead for potential delays and a slower commute. The forecast for southeastern Colorado is not calling for heavy accumulation, however temperatures are expected to dip below freezing. Icy slick conditions could exist on several roadways throughout the region, particularly Monument and Raton Passes. CDOT crews in the region will be on snow shift and applying pre-treatment where appropriate. Travelers should plan ahead for potential delays and slower commutes. Forecasters are calling for heavier snowfall to impact the higher elevations in Northwest Colorado starting after midnight tonight. CDOT crews are on 24-hour snow shifts and will be pre-treating highways from Glenwood Springs and east on the I-70 corridor. The Thursday morning commute throughout the region could be affected by icy roads with slightly reduced visibility due to snow and wind. Motorists should expect icy and snowpacked conditions from I-25 Denver North to Wyoming Border and snowfall accumulation of one to four inches. The eastern plains will see a trace amount of snow but will have winds between 20 to 35 mph with blowing and drifting snow. Crews are on 24-hour snow shift and will be pre-treating the roads and will continue with deicing products as the storm intensifies. Starting Thursday night through early Friday morning, motorists can expect difficult driving conditions, especially along high country mountain passes (CO 145 Lizard Head; CO 62 Dallas Divide, US 550 Red Mountain, Molas and Coal Bank; US 160 Wolf Creek and La Veta; CO 17 La Manga/Cumbres; US 50 Monarch; and US 285 Poncha and Trout Creek). Snow and high winds may cause drifts and blowing snow with limited visibility of the roadways. Friday morning commuters should allow themselves more time for travel. "With many driving in from out of state or for those who are feeling stressed with the holidays, we ask that you be aware if you are feeling drowsy and if you are, pull over and take some time to refresh and wake up before hitting the roads again," said Lester. "The best way to drive in the snow is to be alert, travel at slower speeds, and know the road conditions before you go." Road and weather conditions are available by dialing 511, 303-639-1111, or visiting www.cotrip.org.